As tasty as its chicken sandwiches may be, Chick-fil-A is known just as well for its anti-LGBTQ history as it is for its food. In just the past year, both Buffalo and San Antonio cited its anti-LGBTQ donations as reason to ban the chain from their airports. Now, another city is pushing back against the company's problematic politics in a deliciously clever way, by ensuring a new location set to open in its airport is the "gayest Chick-fil-A in the country." In March of last year, the city council of San Jose, California approved the construction of a new Chick-fil-A at the Mineta San Jose International Airport, and it's scheduled to open soon. However, in light of escalating opposition from area LGBTQ leaders and groups, folks on the council are having second thoughts and feel as though its approval slipped through the cracks. 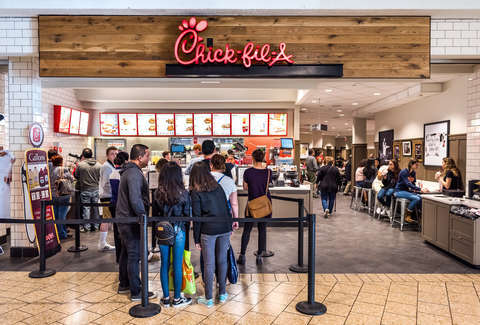 Rather than prevent it from opening altogether, though, members are considering pushing to ensure that when the Chick-fil-A does open, it's just really, really gay. On Tuesday, the council voted to approve the flag idea, and also voted to withhold a contract extension from 2026-2028 for airport restaurants that aren't open seven days a week. That would include the popular chicken sandwich purveyor, which is famously closed on Sundays. Of course, any money spent at Chick-fil-A, even its "gayest" location, will end up supporting the company financially, which may remain be a dealbreaker for some. Still, you kind of have to appreciate the level of trolling going on here.